Now Raindance has come to a close we get to dive into the world of the London Film Festival! 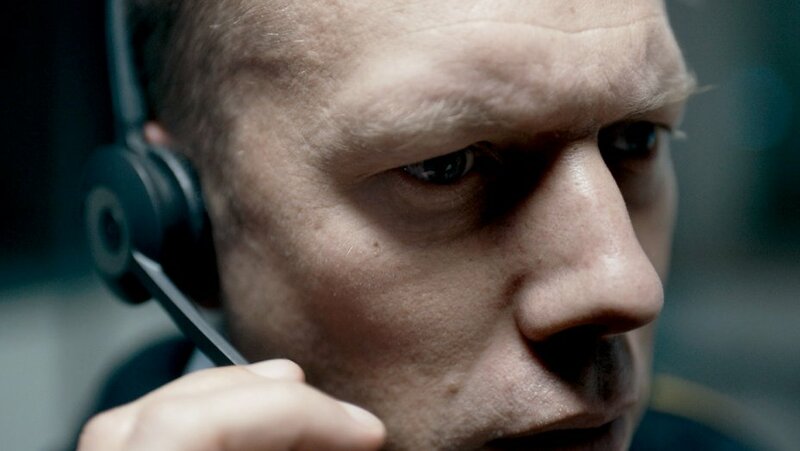 Kicking us off is Gustav Möller's Sundance Audience Award winner, The Guilty, a one room thriller lead by Asger (Jakob Cedergren) a police officer who has been temporarily stripped of his badge and left to take emergency service calls until his court hearing. Fifteen minutes before his shift ends he receives a call from a woman who has been kidnapped which leads us to the beginning of our narrative. Before we enter into this there's play upon dark humour, Asger tells a guy it's his own fault for not knowing his location if he's going to get high among other seemingly trivial calls. You can see it in Cedergren's eyes that he's fed up and something is haunting him beneath the surface. There's brief dips into what the cause may be, the first of these being a call from a fellow police officer on the line, telling him to say hi to his wife for him, met with a "but she left..."
Asger is very likeable but not in the sense that he is charming, we worry for him, we want to know what could possibly be troubling him. He takes the kidnapping into his own hands from the second the first call begins despite his colleagues telling him to leave it in the hands of other people. He has a real hunger to do right by this woman and is frustrated by the obstacles that come his way. We feel with him, he projects every emotion he goes through onto the audience. I did wonder how long the tension would hold because essentially the visuals were Asger with his headset at a private computer but I was fully immersed into the story, wanting to solve this mystery before he could, feeling the sense of urgency he felt. There's no room to solve this without hearing every single call, the narrative fills with more twists and turns every second. I do believe, however, it lost some of its emotional impact through the imagery being so static. Some very traumatic pictures were painted and I just couldn't feel the sympathy in the way I believe I was intended to but had it been told traditionally where we see every single thing that's happening, we would've missed out on the emotional attachment to Asger, which I believe to be the most important part. It's one of those films people will ask you for a synopsis for that is met with the response "I can't say much without giving it away" which leaves me being limited with what information I can share with you, but that's the best part of this film. The mystery. A real hands to the forehead 'I can't believe this is happening' film, will keep you guessing to the last second. The Guilty shows at London Film Festival 11th, 12th and 19th October and releases to the UK October 26th.